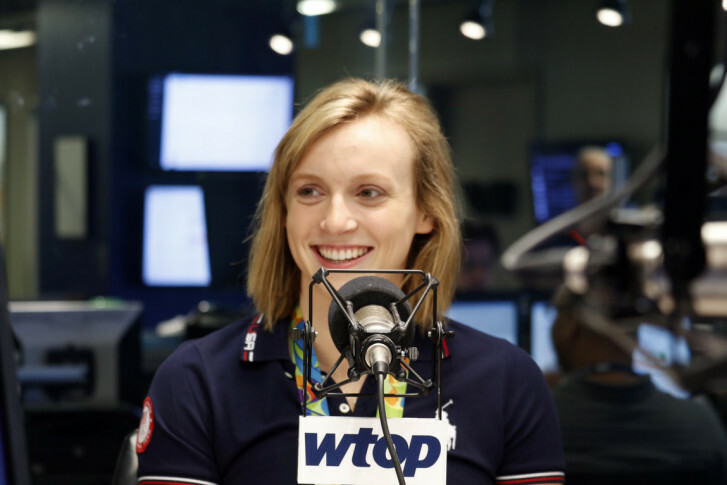 Taking a break from the pool for a bit, Bethesda's Olympic hometown hero Katie Ledecky stopped by WTOP with her coach Bruce Gemmell to chat with WTOP reporter Megan Cloherty about Bruce Springsteen, what she still needs to buy for college and more. 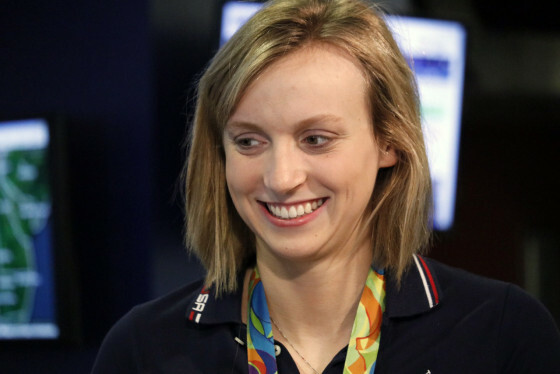 WASHINGTON — Why did 19-year-old swimming phenom Katie Ledecky skip the Opening Ceremony in Rio? (Hint: she had a pretty good reason). What does she think about when she’s racing? What’s her favorite TV show and band? Olympic champion Katie Ledecky stopped by the Glass Enclosed Nerve Center on Monday morning to talk about her triumphant Summer Games in Rio and much more. See photos of her visit and her dominant swimming performances at the Olympics. Taking a break from the pool for a bit, Bethesda’s Olympic hometown hero Katie Ledecky stopped by WTOP with her coach Bruce Gemmell to talk about what’s next for her as she prepares for her freshman year at Stanford and whether she’s already planning for the 2020 games in Tokyo. Check that out here. But Ledecky also chatted with WTOP reporter Megan Cloherty about some offbeat topics. Read the full Q&A below. Cloherty: Seeing the athletes there and seeing the tradition of it — I know it was your second Olympics — but how different was it going into Rio than going in prior? Ledecky: You remember how it was four years ago but, at the same time, I forgot how cool the Olympics were until I got there. You get to interact with people from all over the world, all different sports, just walking to and from different things — the cafeteria, the pool, you could be sitting on the bus next to somebody from Mongolia or something — and you get to meet them and talk to them as much as you can and then you get to compete against the world’s best also. Ledecky: I didn’t go to opening ceremonies this year because I had a race the next morning. Gemmell: No, most of the swimmers do that. That’s sort of the routine for any swimmer that’s swimming in the first couple days of the meet. Cloherty: You just know that you have to focus? Ledecky: I got to go in 2012 because my one race wasn’t until the end of the meet so I had that experience. Cloherty: Any special moment with athletes that you competed against or with in the pool? You were mentioning Simone (Manuel). Ledecky: Mostly just with my teammates and watching them succeed and do something that they didn’t think that they were capable of doing or just do some great things in the pool, and we had a lot of fun outside of the pool as well. Cloherty: I think I saw on NBC when you were being interviewed…where you said that you met [Michael Phelps] when you were little and then he was giving you advice? What did he say to you? Ledecky: He just wished me good luck. That happened in 2012 too, where it was apparently his last Olympics and this was his last Olympics, maybe, and I always flashback and think to when I was 6-years-old and meeting him for the first time and then however many years later I’m on an Olympic team with him. It’s pretty surreal. Cloherty: Less star-struck this time? Ledecky: Yeah, I’ve gotten to know him a little bit. Cloherty: When you threw out the first pitch at Nats Park … what you were thinking about? Ledecky: I’ve thrown out two pitches before so I wasn’t extremely nervous, But, you know, it’s still a little nerve-wracking, throwing a pitch in front of that many people. But I’ve swum in front of that many people, or close to it, before, so I knew I could do it. Cloherty: We got a couple of questions about what you would tell kids who are interested in swimming and following in your footsteps. When did you know you were good at this? When did you know this was your sport? Ledecky: I’ve loved it from day one when I started swimming when I was six. But, you know, I followed the normal progression of anybody just starting out – summer league swimming and then getting into year-round swimming, still doing other sports. And eventually, it was never a decision to drop other sports and just focus on swimming. It was more of a natural thing where I realized I was picking swim practice over going to basketball practice, and I just wanted to give everything I had into swimming. Cloherty: It becomes like a big family. You know a ton of people. Ledecky: You get to meet so many people through the area through swimming, and now I got to meet all of these people around the world through swimming and I never imagined I would get to have all of these opportunities when was just starting to swim when I was six. I think you just set some big goals and work towards them, but also just keep it fun and enjoy meeting all of those people. Gemmell: I started coaching Katie right after the London Olympics so she was already a gold medalist. Cloherty: So you already knew she was pretty darn good? Gemmell: I knew she was pretty darn good but you have to caution yourself. There’s frequently one-hit wonders in the swimming world, and you never know if that’s going to be the case or not but after a year or so working there and I saw her focus and her commitment to her goals and her ability to block distractions, then you knew it was going to be something pretty good. Cloherty: Bruce, what is Katie’s favorite race to swim? Cloherty: Your favorite place to hang out in high school? Gemmell: I was going to say Izes. Ledecky: Oh yeah. It’s a little deli on Rockville Pike. Cloherty (to Gemmell): What do you think is her favorite band? Cloherty: Do you know that Bruce Springsteen follows you on Twitter? Ledecky: Yeah, I found that out a couple of days ago. It was cool. My dad is a big Bruce Springsteen fan. He’s been to 30, 40 concerts, maybe less, I don’t know. Big fan. I have probably 400 Bruce Springsteen songs on my iPod just from different shows and everything, so I became a fan pretty early on. Cloherty: Have you direct messaged him yet? Ledecky: No, I have not. Cloherty: He follows 38 people, this is a very big deal. Cloherty: Binge watch or binge read? Ledecky: I don’t really binge either, but I do a little bit of both. I watch the news, in general, when I get home from practice. Cloherty: What do you listen to to get pumped up before a race? Ledecky: I am not one of those swimmers that listens to music right before a race. Just as when I was younger, if we were driving to a meet in the local area, we would have a lot of Bruce Springsteen on, but then over time I started creating playlists with my dad, a mix of some of his favorite songs and some of mine. Cloherty: So you’re more of a get-in-the-zone, quiet-down kind of person? Ledecky: I like to either talk to my friends or just sit and get ready for my race. Cloherty: What other Olympic sport would you like to medal in? Cloherty: Bruce, what do you think she’d be good at? Gemmell: Crew. A lot of swimmers cross over and vice versa. Cloherty: Bruce, what’s her cheat-day food, if you had to guess? Cloherty: Katie, Is that true? Ledecky: Some type of ice cream, maybe, not chocolate. Cloherty: Marco Polo or Sharks and Minnows? Cloherty: People think you swim day and night like you are always there 12 hours a day. I’m sure it’s a lot of time, but what do you do in your down time? Or how would you like to spend your down time if you had a day off? Ledecky: I like to spend time with my family and friends whether it’s spending time at home or at lunch with my friends. Cloherty: Let’s talk about college. Bruce was saying you’re lucky because you have a little bit of extra time because a lot of colleges have already started. Ledecky: Yeah, Stanford is on the quarter system so my first class won’t be until Sept. 26. Cloherty: Most seniors spend their summers being nervous and going to Bed Bath and Beyond with their mom and you spent your summer at the Olympics. So now what do you have to do before you get there? Ledecky: I have to still do all of those things but I have a limited time to do it. Cloherty: What’s left on your ‘to buy’ list? Ledecky: We ordered my bedding yesterday so I’m getting there. Cloherty: Is it Olympic Ring bedding? Cloherty: What classes are you taking this fall or is there one that you’re really excited about? Ledecky: I don’t know yet because we don’t sign up until orientation. But I’ve been looking at a few classes and I think that with the election this fall, I think that I’m going to take a few classes focused on that because it’s a once-every-four-years thing. Cloherty: And you’re from Bethesda so you already kind of have a heads up on the government beat. What do you think about when you’re swimming a race? Do you think about singing a song or are you telling yourself to kick harder or move your arms faster or pull harder? Ledecky: Those last three are pretty accurate. I’m just focused on what I’m doing. Once I dive in I’m pretty much on auto control. I try to remember one or two things that Bruce tells me before the race. But besides that it’s pretty much just doing what I’m trained to do and kind of blank everything out. I kind of like listen to the water just with the rhythm I can kind of tell how I’m doing. Cloherty: I was going to say how do you do pace when there’s no one around you? Ledecky: I’ve trained for it, I know what I’m doing and I try to lock into that pace pretty early on and get to the wall. Cloherty: Is it hard to train with her because she’s so far ahead that there’s no one who can compete with her in that same level? Gemmell: She’s been training with the boys for years and they can compete with her, so that hasn’t been an issue to this point. Cloherty: It would be pretty cool if you could see that yellow line they put in the pool – that world record line – so you could see where you’re going? Ledecky: That would be cool. Cloherty: Are you getting an Olympics tattoo? Ledecky: No, I am not. I did not get one in 2012 and I do not plan on getting one.